The IRA has put all of its weapons beyond use, the head of the Independent International Commission on Decommissioning (IICD) has said. Here are statements from various politicians and groups in response to the announcement made by General John de Chastelain, head of that decommissioning group. "The leadership of Oglaigh na h-Eireann announced on 28 July that we had authorised our representative to engage with the IICD to complete the process to verifiably put arms beyond use. "I warmly welcome [Monday's] statement by General de Chastelain on IRA decommissioning and the separate statement by the independent witnesses. "This is an important development in the peace process and one we have all been waiting for, for a long time. "The government is very grateful to General John de Chastelain and his colleagues Andy Sens and Tauno Nieminen for their authoritative and effective oversight of this process. "I particularly welcome General de Chastelain's confirmation that IRA decommissioning is complete and that the amount of arms and material decommissioned by the IRA is consistent with the assessments provided by the security services of the two governments last year. "Successive British governments have sought final and complete decommissioning by the IRA for over ten years. Failure to deliver it had become a major impediment to moving forward the peace process. Today it is finally accomplished. "And we have made an important step in the transition from conflict to peace in Northern Ireland. "If the IMC [Independent Monitoring Commission] confirm that all other activity has ceased then that transition, as far as the IRA are concerned, will be complete. "While recognising the great significance of today's announcement we must always be mindful of the victims of violence whose families continue to live with their pain. "The true importance of today is that these weapons can never again be used to inflict suffering and create more victims. "The involvement of representatives of the Protestant and Catholic faiths as independent witnesses in the process is new and significant and should give added confidence to both communities that IRA decommissioning is both complete and permanent." "The IICD statement that the IRA has met its commitments to put all its arms beyond use is of enormous consequence. "It is a landmark development, it is of real historic significance, the weapons of the IRA have gone and they're gone in a manner which has been witnessed and verified. "Many believed that this day would never come, many would say that this should have happened a long time ago but it has now come about. "We are enormously relieved that we can finally close this difficult chapter of the peace process." "This afternoon the people of Northern Ireland watched a programme which illustrates more than ever the duplicity and dishonesty of the two governments and the IRA. "Instead of openness there was the cunning tactics of a cover-up, the complete failure from General John de Chastelain to deal with the vital numbers of decommissioning. "We do not know how many guns, the amount of ammunition and explosives that were decommissioned. Nor were we told how the decommissioning was carried out. "The so-called Independent International Commission for Decommissioning could only say to the people of Northern Ireland that the proof that all the guns and material of the IRA were decommissioned was in an assurance given to them by the IRA. "Not one iota was given to verify that assurance. "It must be clearly stated that both witnesses were approved by the IRA and therefore were accepted by the IRA and in no way could be independent." "The fact remains that the promise made by the prime minister, that decommissioning must be transparent and verifiable and must satisfy everyone, was broken. "There were no photographs, no detailed inventory and no detail of the destruction of these arms. "To describe today's act as being transparent would be the falsehood of the century." "I am very proud to be part of this leadership and this Sinn Fein party and I consider this afternoon's announcements to be a very full and a positive and conclusive response to the appeal that I made in April. "That time you will recall that I called upon the IRA to pursue their goals by purely peaceful and democratic means. And this was in keeping with the Sinn Fein position going back many years. "I want to commend the leadership of the IRA for moving so decisively. Now I know that today's announcement will be difficult for republicans. "I saw that myself earlier on as we watched the press conference of the IICD and the two independent witnesses. But this was a very brave and a very bold leap and all of us need to think beyond it. We need to think beyond this moment. "It's not the leap itself but the place that it takes all of us that is important and for this reason the IRA's courageous decision was the right thing to do. Both governments now need to be decisive, focused and creative. "They need to implement the Good Friday Agreement as they have promised to do. There has to be progress on equality, on policing, on human rights, on people on the run, on victims and on all the other issues which are outstanding. "There must also be progress on other issues including prisoners and northern representation on the Oireachtas. "There must be a proper peace dividend to tackle inequality, discrimination, deprivation and sectarianism wherever it exists and the political institutions must be restored." "Clearly it would appear that a significant development in terms of decommissioning has taken place. "However we regret that once again, this development has failed to maximise public confidence. "We will wait and see the outworking of events. It is imperative that not only arms are decommissioned but that the dismantling of the republican movement's criminal empire is also completed. "In order to restore confidence, we call on the government to immediately publish the estimates that were given to the IICD. "This move by republicans should illicit a response from loyalist paramilitaries who said that if the IRA decommissioned that they would follow suit." "The gun is at last being taken out of Irish politics. This vindicates all of us who have always argued for a peaceful way forward. 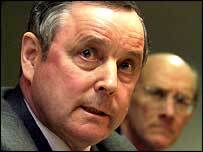 "Those of us who have always been clear that decommissioning was a requirement of the Good Friday Agreement. "Just last February, the IRA warned the Irish people not to underestimate the seriousness of the situation. The Irish people didn't. They stood firm for an end to guns. Now their strong stand has been rewarded. "Today's events also demonstrate the utter futility of violence. Violence never won anything in the north. Violence does not pay. It costs. In lives lost, in economies ruined, in communities wrecked. "That's something that so many victims of the troubles know too well. Today as we look forward, we must not leave them behind - isolated and forgotten. "It's something the loyalists need to learn. The best thing they can do now to free their communities of poverty and fear is to give up the drug dealing, the racketeering, intimidation and murder and destroy their guns. "The focus now turns to the other activities of the republican movement. "Over the coming months, we will study closely the reports of the Independent Monitoring Commission, as they assess the activities of both unionist and nationalist paramilitaries. "Some unionists are still refusing to engage in any contact with Sinn Fein, while having no problem in joint activity with loyalist parties, despite the violence on and after September 10."